Universe of Violence is back! The last we heard from this long-running indie toy line was in 2014, with the release of the fantastic Satyrant and Venus Maneater figures. 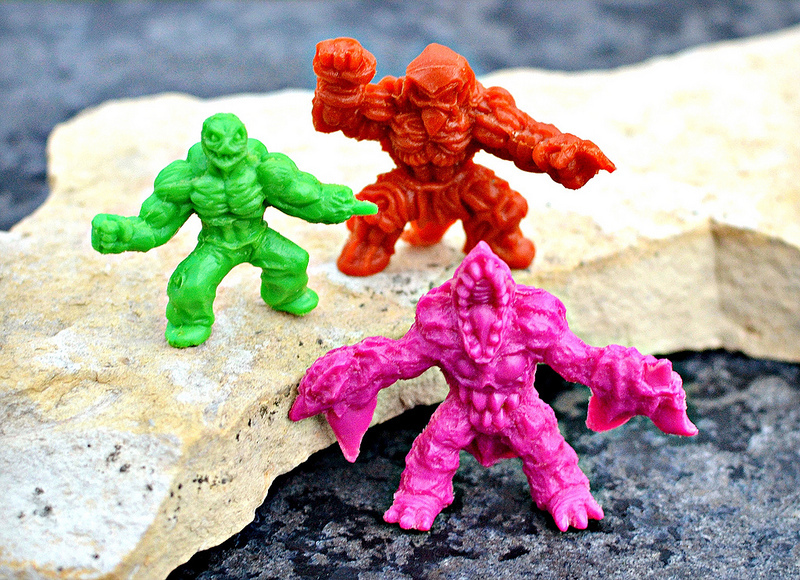 Now, we've got three brand new brutes to add to the gang via UoV Chaos Dimension Wave 2. Meet West Nile, Deadface II and Hell Chicken. All three figures were sculpted by Jimmy Rommel and cast by Justin Gadze, who collaborate as Ironhaus Productions/Ironhaus Productions Oz (Jimmy's based in the U.S. and Justin is in Australia). 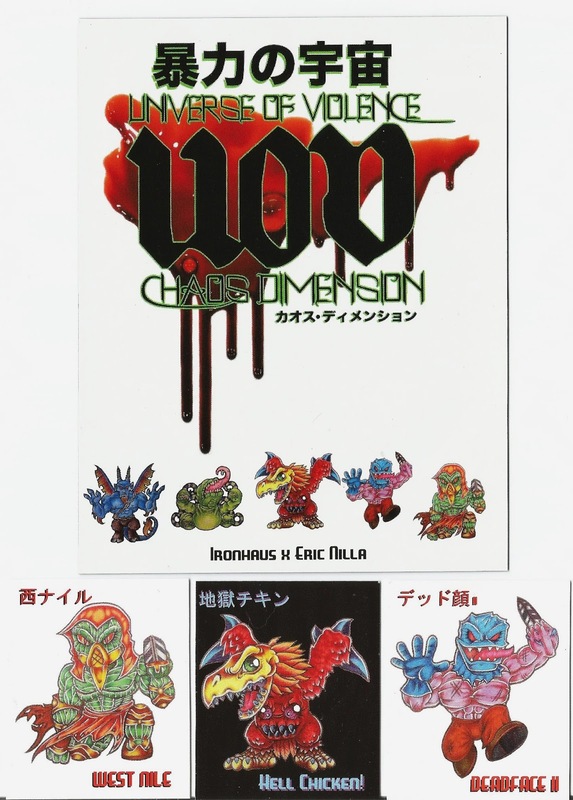 Anyone familiar with Jimmy's work should be able to recognize these gnarly monsters as his creations. As usual, the sculpts are full of character, highly detailed, and fit right in with past UoV releases. Combine that with the great care Justin obviously took in producing the figures, and you've got a release well worth picking up. The figures are available now through the Ironhaus Oz Storenvy site. All three are sold individually in rubber, with a variety of colors offered (there are also some special variants randomly thrown into the mix, like color-changing, scented and glow-in-the-dark figures). They range from about 1.75 to 2.25 inches tall. Plus, to coincide with Wave 2, Ironhaus has re-released both Venus Maneater and Satyrant in both rubber and resin. 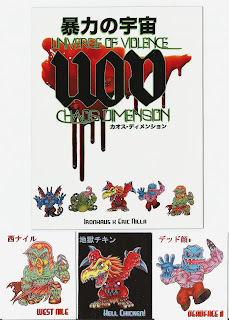 All come in a bag with a header card along with awesome freebies such as Neclos Fortress-styled character cards, stickers and a fun UoV magnet. This figure has been in the making for a long time, and now it's finally seen the light of day. As you can see, it has an amazing amount of texture and detail, with the whole body being made up of what looks like exposed muscle. 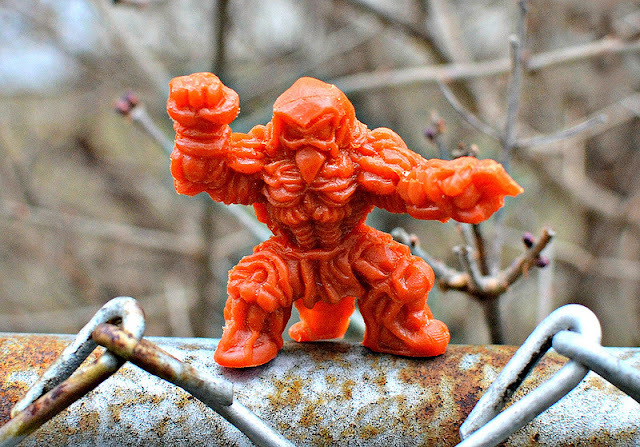 It's a kickass sculpt that really embodies the spirit of UoV. I also just discovered that my figure changes color when put under warm water--it goes from the orangey-red shown in the photo to a lime green. So cool. You might remember the Deadface character from previous Universe of Violence releases. He first appeared in one of the original UoV sets from 2012. 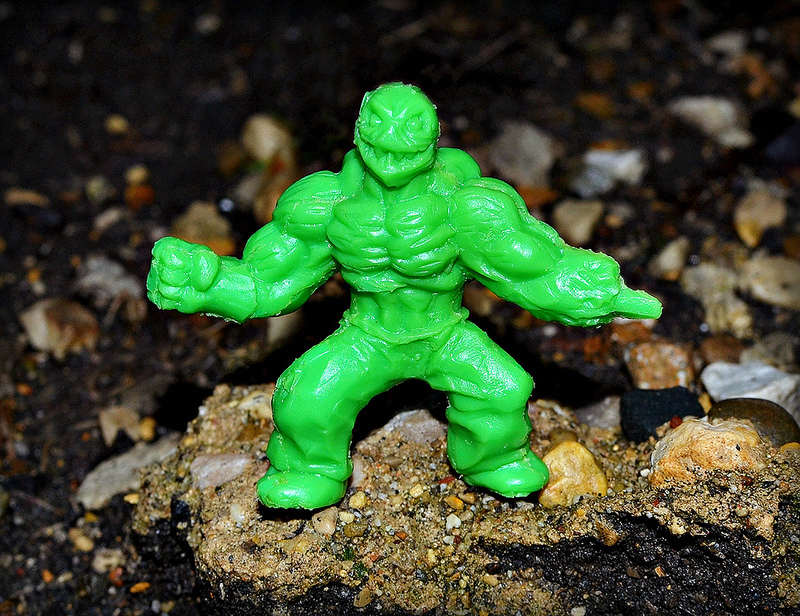 Here we have an updated version of this muscle-bound baddie with a fresh, more dynamic sculpt. My favorite part of this figure is the face--check out that creepily sadistic expression ol' spike-hand's got going on. Remember Jimmy's popular Hell Turtle figure from a few years ago? Well, now we've got Hell Chicken! This seems to be the most popular figure in Wave 2, and for good reason. I mean, it's a creepy demonic chicken monster. The concept in itself is an instant win, and the sculpt does not disappoint. It doesn't necessarily scream "chicken"--the wing-arms are the most chicken-like part--but that's not really a bad thing. I like the fact that it's a monster that's somewhat chicken-like, instead of the other way around. 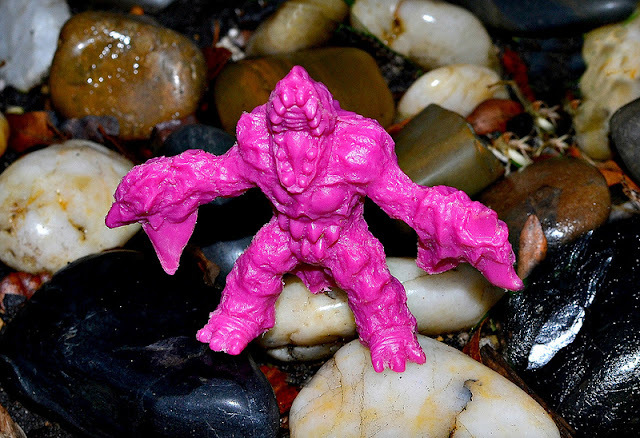 I chose one in a neon purple color reminiscent of neon purple Monster in My Pocket figures, and I don't regret that choice. It shows off the detail really well. Mine also came in one of the scents, which smells kind of floral. I believe it's the "aphrodisiac" scent. Maybe the scent Hell Chicken emits to lure prey into its lair before attacking? And there we have it--the latest UoV offerings from a couple of very talented guys. Again, you can pick up all three figures here. It's good to have UoV back, don't you think? Wow, they are pretty nicely detailed.